I feel like I've been writing all my life. I have copies of poetry I wrote beginning at age 8. Even then, voices whispered in my head...calling to me and wanting to spill out onto paper. 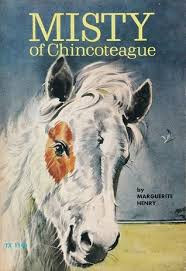 By age 11 I was entering writing contests, and even won a contest sponsored by my hometown library to receive a copy of MISTY OF CHINCOTEAGUE. It even had a book plate on the inside with my name inscribed on it and I thought I had won the lottery. Over the years I've written snippets and full manuscripts of hundreds of stories...picture books, chapter books, young adult fantasy, essays...stories swirling and dancing through my mind when there was no one else around to keep me company. Writers ALWAYS have another story waiting to be told. It might go into hiding and we have to work hard at enticing the muse to show themselves. And sometimes the stories tumble out of us so quickly, we stumble over them, just trying to write all of them down before they fade from our memory. I know where that book is in your house. I may have to hold it ransom until I get your next published novel. Lock your doors. Hahaha.